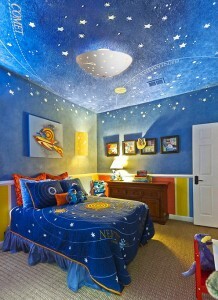 An outer space theme bedroom is perfect for kids with a passion for stars and planets. A child’s room should be a reflection of his or her personality, goals, and interests. Does your child like dinosaurs? Astronomy? Butterfly collecting? Here are six cool bedroom themes that fit almost any kid’s style. 1. Dinosaurs: Start with earthy wall tones, wooden furniture, and some leafy motifs for that Jurassic feel. Real or artificial ferns add to the prehistoric setting. Kids who love dinosaurs will love our dinosaur-themed light fixtures. Made of white earthenware clay, they are beautifully carved with the huge prehistoric reptiles that continue to fascinate us. Wall sconces with T-Rex, or bowl sconces with Triceratops? Our wide range of sizes, shapes, and designs means that any young dinosaur enthusiast can feel right at home. 2. Plants: Junior gardeners will love being surrounded by plants and flowers. Unfinished wood is a natural choice for furniture. For the walls and linens, choose various shades of green, from seafoam to forest. Potted plants, of course, are a must. The windowsill is the obvious location, but shade-tolerant houseplants can grow in almost any spot. As for lighting, desk lamps and ceiling fixtures with floral designs fit beautifully in our young botanist’s room. Our Blooms & Bees ceramic light is among our many beautifully designed ceiling light fixtures. Pull all these elements together to inspire any child’s fascination of nature. 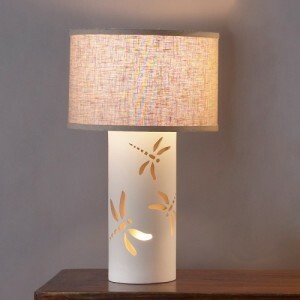 The dragonfly cutouts on this children’s lamp make it perfect for the kid who loves bugs. 3. Bugs: Plants are great, but some kids are into the more animated parts of nature — creepy, crawly bugs. We have a wide selection of light fixtures that fit any insect-lover’s dreams, like our marvelous Dragonfly Dream table lamp. Mix and match our bug-themed lighting with our floral lighting designs to turn the room into a rain forest! A bug theme doesn’t have to be natural. Use cool blue tones and modern designs to surround a blue-glowing ant farm and inspire the scientists of the next generation. 4. Nautical: A marine-themed room can inspire young sailors and aspiring mermaids to continue dreaming of the ocean. Our anchor-themed wall sconces are a great addition to a young sailor’s lifestyle, and our seashell-inspired pendant lights would fit any young marine biologist’s agenda. Match these light fixtures with a nautical aquamarine color theme and accessorize the wall or bed frame with seashells to bring any child closer to the ocean. Be careful — with a theme like this, you might need to invest in a lifeguard! 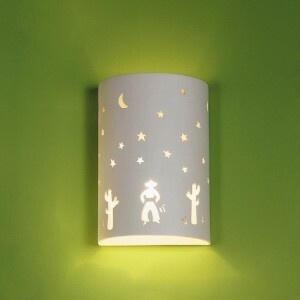 Enhance a western-themed kids’ room with this sconce, featuring cactus, cowboy, and night sky. 5. 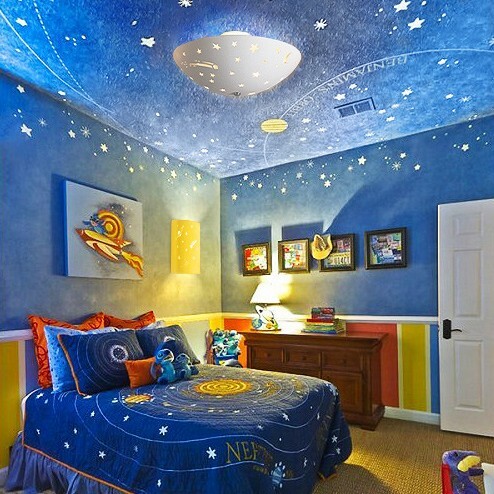 Outer Space: Send your young astronaut into the skies with a space-themed bedroom. Futuristic furniture with shining chrome surfaces creates the feeling of a space station. Stick glow-in-the-dark planet shapes on the wall to create a cool effect when all the lights are out. Installing a dimmer on the overhead light will turn the room into a planetarium. Shaped like a star, the Starry Sky ceiling lamp will bring any young space adventurer closer to the skies. Add a small telescope by the window to motivate the astronomer in any kid. 6. Western: For the aspiring cowboy or cowgirl, focus on brown tones and rustic finishes. Horseshoes, stars, and cactus shapes create the feel of the old west. To light the room, combine our Cowboy and Cactus wall sconce with a light earthy exterior for a perfect wild-west themed room. And have you considered bringing the western theme into the bathroom? It’s not as common as a nautical bathroom theme, which makes it surprising and fresh. Choose wood-framed mirrors and a cowboy-themed vanity light. What’s the coolest themed kids’ bedroom you’ve seen? Tell us in the comments, and if you have a great photo, we’ll add it to our children’s themed bed & bath board on Pinterest!